We said goodbye to our outdoor grill back in late October. Covering it for the winter is always a bittersweet affair. But the end of the warm weather doesn’t have to mean the end of grilling. I get good use out of my trusty stovetop grill—a bistecchiera in Italian—throughout the late fall and winter and into the early spring. And not just for steaks and chops. I love to grill vegetables, too. This week’s featured recipe for Grilled Sweet Potatoes illustrates a typical way to prepared grilled fall and winter vegetables in the Italian manner, albeit with a vegetable that is rather “exotic” for most Italians. (Sweet potatoes are sometimes called “American potatoes” in Italy.) After grilling, the vegetable is marinated in garlic, oil, salt and pepper, along with some red pepper flakes if you want a little heat, for at least 30 minutes before serving. A bit of minced parsley is optional; this time I added some fennel fronds I had on hand. I really enjoy their mild anise scent. The most typical vegetable for this treatment is zucca, or Italian pumpkin. But as I’ve written about before, I’m usually disappointed by the tastelessness of pumpkins Stateside, so I prefer sweet potatoes (aka yams). And, of course, you could use the same treatment on other winter squashes and other winter vegetables. It’s a quick and easy recipe that lends a touch of summer to the coldest of winter nights. 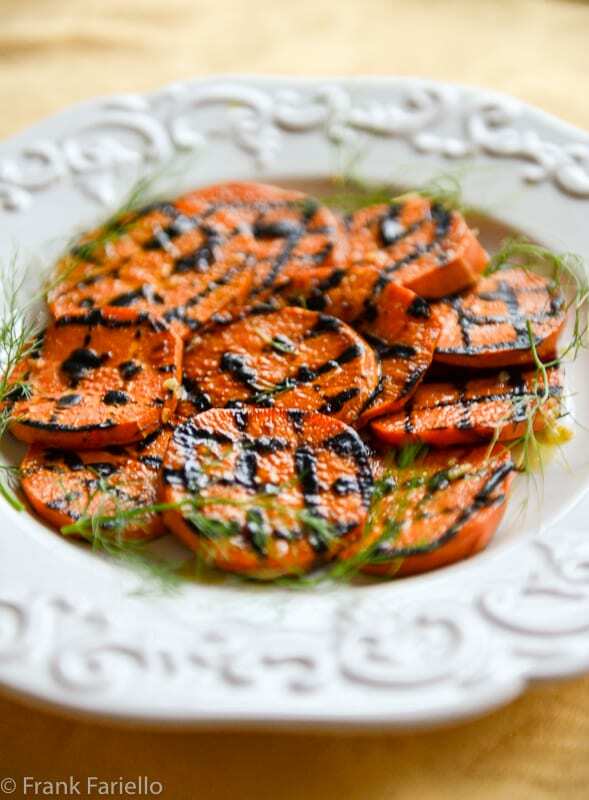 Grilled Sweet Potatoes make lovely antipasto or side dish. Prepare the marinade by mixing all the ingredients indicated together in a bowl. Set aside until needed. Heat a lightly greased stove-top grilling pan (or griddle) on medium heat until quite hot but not smoking. If you like cross-hatched grill marks like those pictured here, grill them for about 2 minutes, turn them over and grill for another 2 minutes, then turn them over and rotate them 90 degrees, grill another 2 minutes, then turn them over again for a final 2 or 3 minutes, until done. As the sweet potato slices are done, transfer them to a bowl, then nap the slices with some of the marinade. Repeat until all the slices are done, adding all the remaining marinade. Mix everything well. Let the grilled sweet potatoes rest in the marinade at least 30 minutes before serving. They are better if left for several hours or even overnight. You will notice that I’ve been rather fast and lose about the measurements for the marinade. Well, that’s because you really don’t need any. Let your good sense and taste be your guide. It’s the way most Italians—indeed, most experienced cooks—cook. Stovetop grills come in all sorts of shapes (well at least two: round and square) and sizes and materials. I like the heavy, cast iron ones the best. For years, I ‘ve had an old, trusty round Le Creuset that I love. Staub also makes some excellent stovetop grills. And, for the economy minded, Lodge offers a much less expensive alternative. There are also those countertop electric grills, although I can’t say that I’ve had much luck with them myself. (And, of course, if you have access to an outdoor grill this time of year, by all means use it.) Finally, the same technique works for stovetop griddles as well, in which case you’d be making your sweet potatoes alla piastra. Besides sweet potatoes, other winter vegetables that take nicely to grilling include carrots, mushrooms, fennel, Brussels sprouts and onions. And of course, if you have a source of winter squashes that you enjoy, by all means grill them up, too. Some people swear by pie pumpkins, but I find them disappointing. I’ve had better luck with other varietals, particularly kabocha, which can be pretty darn flavorful. Some leafy vegetables like Belgian endive and radicchio grill up beautifully, although I wouldn’t bother with marinading them. Just give them a good pour of olive and season generously, then serve them while they’re still warm. Grill the sweet potato slices on both sides until tender but still just slightly al dente, about 8-10 minutes total. Regulate the temperature so the sweet potato grill fairly gently. You want them to have time to cook through without too much char. If you like cross-hatched grill marks, grill the slices for about 2 minutes, turn them over and grill for another 2 minutes, then turn them over and rotate them 90 degrees, grill another 2 minutes, then turn them over again for a final 2 or 3 minutes, until done. Your recipe is wonderful and beautifully presented. I have sweet potatoes very often but I have never tried them grilled. Great idea! Thanks, Alida. They are very nice made this way. Sweet potatoes are also quite exotic for us Greeks too lol:D But due to their nutritious benefits they gained a little popularity in the last few years. But still, they’re not used by many. Great work Frank, thank you! qui in Italia le patate dolci non sono molto usate e nemmeno facili da trovare, io ad esempio non le ho mai mangiate ma dalle tue foto sembrano buone ! Something lovely to add to my repertoire, seems like it would be a welcome addition to an antipasto platter. Thanks, Paula! I think it would be a nice addition, season but light element among some of the richer offerings. I don’t think I have ever seen a sweet potato in Italy! These look fantastic. They are a rarity. In Rome we used to have to go down to the international market at piazza Vittorio, which catered largely to immigrants. This looks like a great recipe for sweet potatoes but also for many other vegetables. I love the ides of the dressing on the warm grilled potatoes! I like the sound of that combination, John! We never have to cover a grill here in LA, so this is great! I’m not a huge sweet potato fan, but my family loves them, so this is a wonderful idea. Can’t even look at those sweet potato dishes with sugar and marshmallows as it does my head in. Why don’t people see that simple is better? Lord knows! The thing I like about this dish is that it actually plays down their sweetness, which definitely becomes cloying when you double-down with sugar and marshmallows. I’ve made sweet potatoes very similarly to this recipe, but using butter instead of olive oil. I’ve served them on Thanksgiving this way. No marshmallows in this house! I love sweet potatoes and will try this recipe soon. Thanks for posting. I’ve never had sweet potatoes prepared in this way. It sounds delicious. Thanks, Jeff. Worth a try!